Website template design or HTML web templates are used for designing a website. Templates allow fast and frequent changes in the content whenever an upgrade is required. A well-built template provides flexibility and eases the access. CSS in web design adds style and graphical modifications like a change in fonts, themes as well as in other attributes. It helps users to access the website quickly and easily. Template designing is a pretty easy task. But, if you cannot design a template on your own, you need to contact experts in providing reliable Template design services to help you with website designing. Our diligent team at TechSupportDubai deals with global customers and creates an amazing template for their websites. Connect with us and get affordable designs quickly. Templates are always an integral part of a website design. There are many factors that you should keep in mind before designing a template for your website. Content Width: A business always runs well when it has a full-width design template. Full-length content is for creative designs and box length contents are for business purposes. Having a box width might decrease the views and popularity. Page Header: Choosing the right header is a much more critical decision than a designing decision. It is an important factor as it comes on top of the page whenever someone opens your website. Viewability: If you do not have the essential tools, you may end up creating a website without any views or popularity. 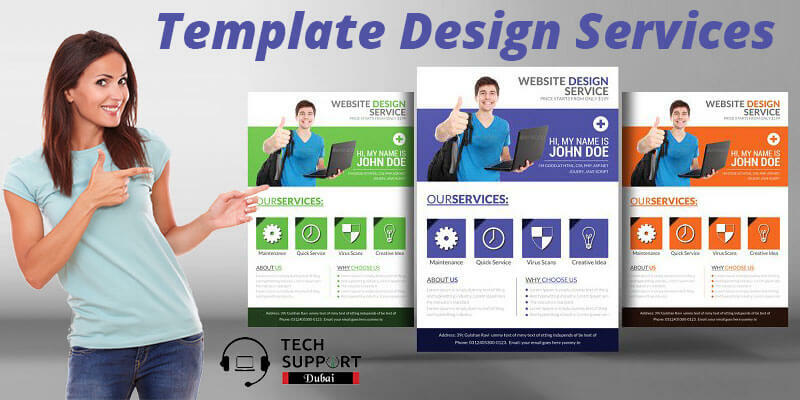 Our Engineers at Tech Support Dubai has developed a perfect solution for you to create a perfect template design for your website. Are you searching for the best template design company in Dubai? With our help, you can upgrade your website with interesting and attractive templates. With years of experience, we have all the essential tools to create a well-designed template. We develop a user-friendly and well-developed website that is compatible on all devices. We deal with global clients and all our customer reviews are independent and verified. Our project solutions are integrated with perfect codes and API. We provide you with the best template design within a limited time and at an affordable price. Our experts can provide amazing services and quality management systems. We offer flexible templates for our clients. Our coders strictly concentrate on coding quality, standard and delivery time. You can directly call at our helpline number for template design services in Dubai. Our well- trained experts and professionals are available round the clock to assist you with perfect template design. You can even chat with our experts at Tech Support Dubai on our live chat portals and you can comment on different ideas to create a template design. We also have an official email id where you can directly send your service request. Our experts will connect to you soon to provide you with a perfect template design and enhance your website. We also provide Android app development service in Dubai.